Over the course of day 1, the pit crew was working diligently to ensure a HAB 3 climb. Every match, we’d go out and say “maybe this is the one!” and then it wasn’t. Still, we had hope in our hearts and spirit signs in our hands as we patiently waited for our time to shine. 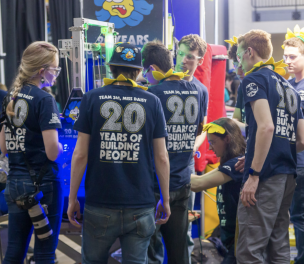 We even developed a new cheer; as the robot began to climb, we gradually built in volume as we yelled “yaaaaaaaaah!” It wasn’t until one of our final matches of day 0 when we got to yell “YEET!” Our robot had successfully climbed onto HAB 3. It was a joyous moment–it was to be remembered by the masses as the time we did that thing we’d been trying to do for a while. From then on, time was measured as BH3 (before HAB 3) and AH3 (after HAB 3). BH3 were considered the dark ages, obvi. In the times of AH3, our robot had varying levels of success getting onto HAB 3 again. However, it was able to do so three more times throughout the competition, and for that we were very grateful. As for cargo and hatch scoring, we’ve made massive improvements since Westtown. After realizing that our center expander mechanism wasn’t quite doing the trick, we developed a new design that we like to call the Super Poisonous Viper Tail (super intimidating). This design worked much, much better. It put into practice our idea of “touch it, own it,” which just means that we don’t want to drop anything in game. The cargo mechanisms worked just as well–the way that cargo moves through the robot? Ugh, it’s beautiful. 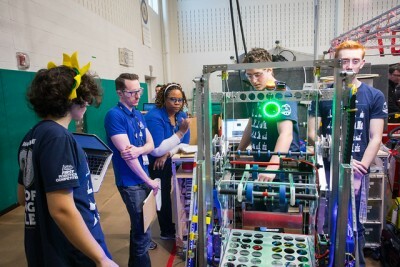 By the end of the competition, our drive team was able to score 9 gamepieces and achieve a HAB 3 climb all in one match. It was pretty spicy. Come elimination matches, we landed on an alliance with teams 5113 and 484. Together, our strategy teams worked to establish a plan of action that would ensure the scoring of as many gamepieces as possible. We were responsible for snagging our alliance a HAB 3 climb, which was a pretty daunting task. 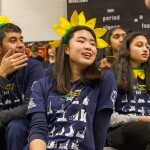 Nevertheless, we were able to make it to a tiebreaker match in quarter finals, where we tied. Again. 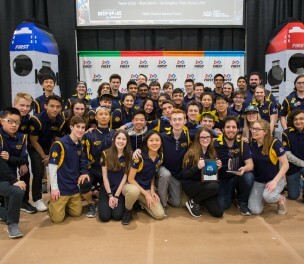 However, the alliance which would eventually win the event was granted the win because of tiebreaker rules. Though we were a little disappointed, we were extremely proud of our improvements. 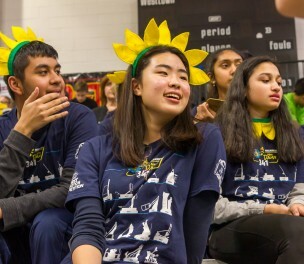 After elimination matches were over, our team gathered in the stands for the Awards Ceremony. As we mentioned previously, we were fortunate enough to win the Entrepreneurship Award once more. It is a very pretty plaque, and it suits our pit display quite nicely, so I am rather excited about having two of them. 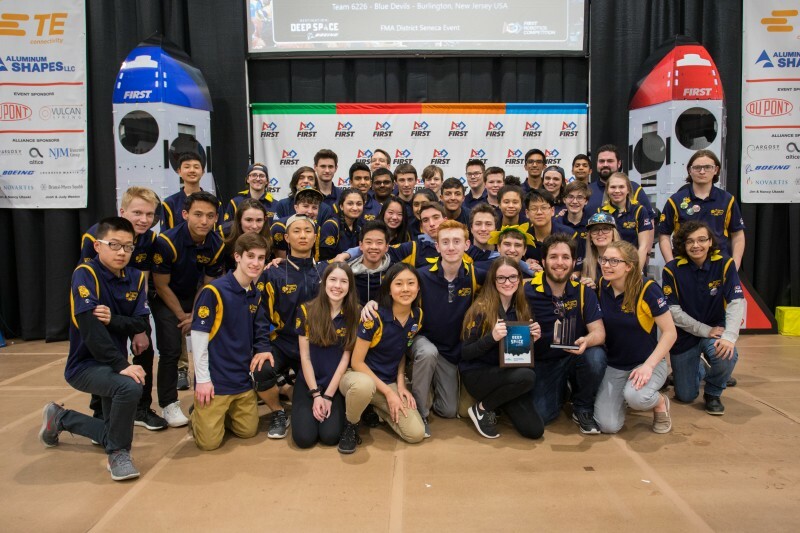 We ended the weekend knowing our robot was ready for more action at Bensalem, and had several ideas for improvements. BH3 will forever be remembered as the dark ages–a time we will hopefully never face again.